MIAMI — The only Miami Heat letdown on Friday night concerned first-half defense, and that proved to be a small issue since Sacramento matched it. 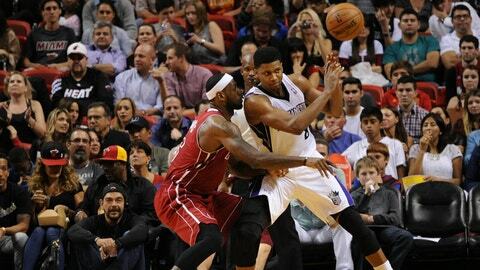 Two nights after a hard-fought come-from-behind victory against Eastern Conference rival Indiana, the Heat pulled away in the third quarter en route to a 122-103 win over the Kings at AmericanAirlines Arena. "The total opposite," said Chris Bosh, who scored a team-high 25 points. "Wednesday was more of a grind-it-out style, today was the Lakers in the ’80s." Miami’s "Showtime" became more defensive in the second half because, well, it had to. "It’s a fun game to play in for a while," said Dwyane Wade, who scored 20 points, "but you gotta get stops if you want to win." Stops were few and far between during the first 24 minutes, after which the Heat led 67-61. "It was like an All-Star Game — just scoring, all offense" Rashard Lewis said. There were several Heat first-half highlights: Bosh had 19 points and seven rebounds. LeBron James had a driving slam over Sacramento rookie Ben McLemore. Ray Allen dunked twice in a game for the first time in nearly two years. "Jesus Shuttlesworth was out in full effect tonight," said James, who Thursday night watched Spike Lee’s "He Got Game," in which Allen portrayed the high school star. Allen’s second dunk came after he grabbed a rebound, raced up court with the ball, then drove the lane as two Kings defenders parted like the Red Sea. "Did you see how that lane just opened up for Ray to go get dunks? Crazy," Wade said. "It doesn’t happen for anyone else." Allen had an idea why that happened. "By nature, I’ve always had the tendency to want to share and I think that gave the (Kings) on the break thinking I was going to pass it out and I think that threw them a little bit," he said. "I was surprised. I said, ‘Hey, I’m going to take off and see how it goes.’"
Allen had enough ups to dunk twice despite suffering from right knee tendinitis that had bothered him for about a week. "I started the game, and it kind of persisted," he said. "As the game went on, maybe that first two minutes it got a little worse, then I just played with it. It’s just something I’m going to have to monitor." Leading 72-71 with 8:45 to go in the third quarter, Miami went on a 21-6 run for nearly six minutes. Bosh had 6 points and Shane Battier made two 3-pointers during the spurt. It was the first time in seven games Battier sank multiple 3s. He shot 3 of 13 from long distance in the previous six games, and didn’t even attempt one in the three games before Friday night. "It’ll be nice to go home (Friday) and not flail myself," Battier said with a laugh. "Actually, you feel like you did your and helped the team win." Amazingly, Sacramento lost by 19 points despite shooting 58.1 percent overall. "We were like, ‘Man, we’ve got to bring that percentage down and we’re forcing turnovers — that’s not helping our numbers right now,’" Bosh said with a chuckle. "We had to get used to the pace of the game defensively. Kind of slow it down, run some sets and get what we want." Miami also shot well (61.4 percent) thanks largely to 70 points in the paint and 22 off fastbreaks. "Defensively, it didn’t start off like we wanted, but our energy level was high and we were able to keep that on," said James, who had 18 points, six rebounds and eight assists. "It was a tough game. Coming off an emotional win on Wednesday, coming back less than 48 hours and playing Sacramento was a tough game but we’re a very professional team and we understand what’s at stake. "We can’t have a win like we had on Wednesday and come in and try and lay an egg. We came in with a professional mindset and got a good win."